Themes and ideas from a number of different musical traditions get together instinctively to create an original Electronic music album, a fruit of raw passion for music. Oren Eilam (born 10 June 1971) has a PhD in Psychology (research), is an Israeli poet and poetry editor, and an amateur chess player. His first album is an expression of musical instincts and passions that have been accrued and gathered in his mind throughout his first 40 years of living. 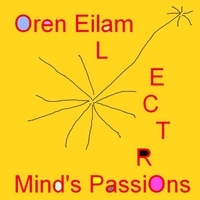 In this album O. Eilam realizes these passions and instincts using improvised electronic music that touches upon different musical traditions (trance, world, classical, jazz, etc.). Having no musical education whatsoever, and no practical musical experience, O. Eilam demonstrates in Mind's Passions that by connecting to deeper layers of oneself at the age of 40 (or much earlier or later for that matter), one may manage to find music that, in a sense, is probably part of the syntax with which one is used to communicate with oneself and others. Each one of the five tracks in Mind's Passions was recorded in "one shot" by one person (O. Eilam), namely, in real time with no additions or subsequent editing. Thus, hopefully this album brings to its listeners an experience of curiosity, authenticity, exploration, search and finding. With no particular techniques at hand, and no burden of living up to the standards and expectations of his still non-existent audience, O. Eilam was left with no better option than releasing his inner child and letting it run free on the keyboard.